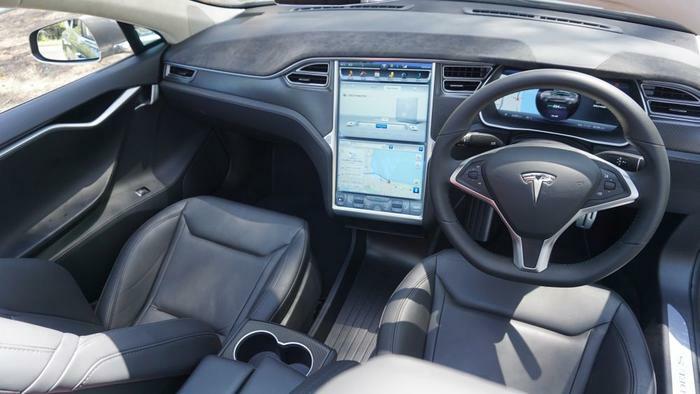 Sliding behind the wheel of a Tesla Model S must be what it’s like to travel to the future. No other car feels quite like it. The obvious reason has to do with its electric motors, but the drivetrain is one part of a grander picture. It might even be a masterpiece. Behind this feeling is the car’s technology. Never mind that it has a 17-inch display and another screen replacing the instrument panel. Or that it has sensors surveying its surroundings. And can be driven autonomously on highway roads, accelerating, decelerating, indicating and merging, all on its own. It feels futuristic because Tesla takes technology and uses it to make driving simple. Those screens are there to rid the dashboard of a hundred buttons. Clever software presents all of the options in a style familiar to an iPhone. And we all know how to use one of them. The lack of a handbrake, door locks and ignition button isn’t a deficiency. Rather, the Model S is clever enough to know when these should be applied. Perhaps then it is the small touches, the granular changes that take place beneath the skin, that leave Tesla’s cars feeling a generation ahead. Under the aluminium body is a floor lined with an 85kW battery, which Tesla claims is good for a theoretical 491 kilometres of driving. It feeds power to two electric motors — one mounted between the front- and another between the rear-wheels for an all wheel drivetrain. Combined they deliver 515kW of power. That’s more than a Ferrari 458 or a Lamborghini Huracan. Only this power drives a sedan weighing 2.239 tonnes. There’s an ethereal quality to the P85D’s acceleration. No ramping engine note warns of its speed and there’s no drop in power between gear shifts. This car has one gear and the torque is delivered at a constant maximum. Occupants lose a sense of stability. Bodies sink into large seats. Organs are pinned down. This is what happens when the car’s aptly called ‘Insane’ mode sends it to 100 kilometres in 3.3 seconds. It would be a violent affair, were it not for the muted motors and its level of luxury. Going any faster in a family sedan would be ludicrous. 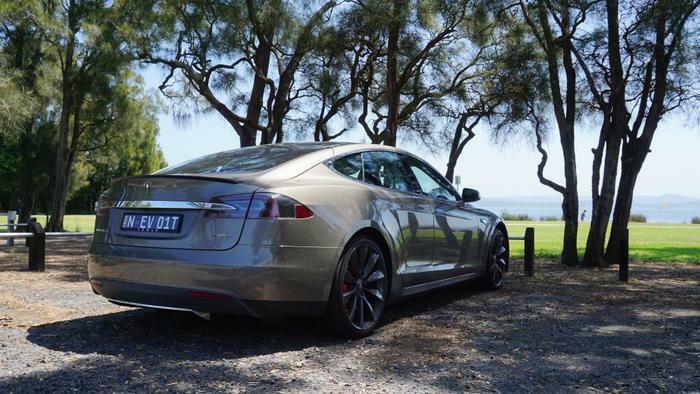 Tesla charges extra for the privilege: $18,600 for ‘Ludicrous’ mode and the mandatory 90kW extended battery. The result of this splurge is a sprint to a 100 kilometres in 3 seconds flat. The power is intoxicating, much like the thrills of a rollercoaster, but the speed isn't what sticks with you after a drive. A quiet car is a luxurious car. 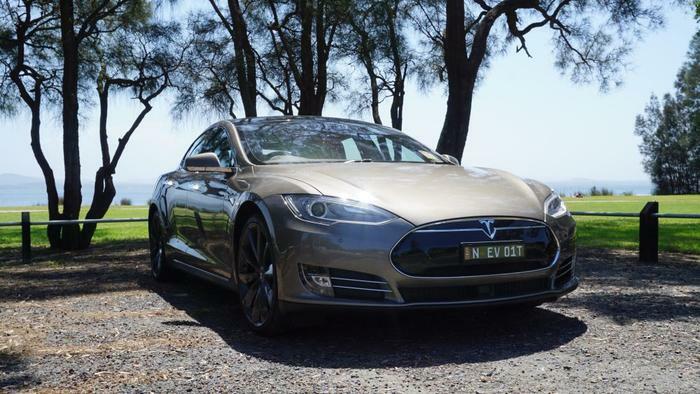 And the lack of a petrol engine helps the Model S achieve a level of quiet foreign to its rivals. The car’s ride, augmented by $3600 air suspension, is equally comfortable. Faltering is the quality of its leather and the cushioning of its seats, as the Model S dismisses excessive comfort for utilitarianism. Driving the P85D on civic roads is where it excels. The silent note of its motors make it utterly inconspicuous, as though this expensive sedan is invisible. It’s a large car that benefits from generous interior space. Take into consideration the panoramic sunroof, a $2100 optional extra, and there’s a semblance of freedom, even when trapped in gridlock traffic. Obvious problems hold the Model S back. A petrol car has no tether. Barrels of petrol can be stashed in footwells in case there are no petrol stations. Even though there always is. And that’s the beauty of cars that run on crude fuels; the vast infrastructure allows you to go anywhere. 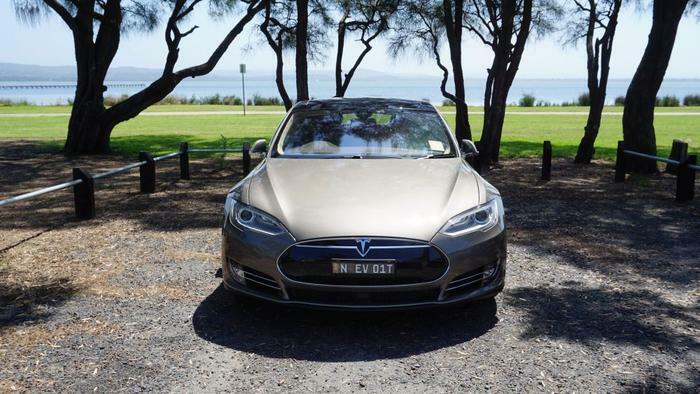 All of Australia has six Superchargers to date. These charging stations will replenish the Tesla’s battery from flat to 80 per cent in 40 minutes. Tesla plans on adding ten more stations in a bid to create a network spanning from Melbourne to Brisbane. Otherwise charging a Model S takes place at home. A proprietary charger installed in garages will charge the car’s battery in approximately six hours. Select businesses have the same chargers in a move that offers some relief when travelling beyond comfort zones. Extreme situations warrants the use of a mobile charger, which plugs into an ordinary 240 volt socket, but its rate of charge is too slow to be practical. Every hour buys 10 kilometres. The problem then isn’t the Model S, but rather the infrastructure that affords cars mobility. A great Australian roadtrip would have to be short in this car. And subsequently less great. Maybe this is why the Model S P85D feels every bit a car of the future, because our today has yet to catch up to its promise.